Since I stopped eating meat about three years ago, there are few foods that I truly miss. One is pepperoni pizza, and the only pepperoni substitute I've tried smelled like dog treats. It did not taste much better, I don't think, but I've never eaten dog treats. In any case, now I eat olive pizza and I cope. The other is barbecue. I'm from Kansas City, and we take our BBQ very seriously. It's everywhere, and it's really good. But it is not vegetarian. This is very sad, and very not okay. A while back, Grant said one of his coworkers eats jackfruit that supposedly tastes like pulled pork. Yeah, okay, whatever. WTF is jackfruit anyway? I ignored this as long as I could, but then I couldn't take it anymore. I'd been BBQ-less for far too long. 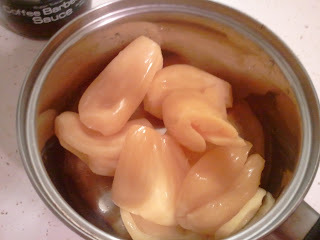 This is jackfruit, which you can find at some Asian markets and some grocery stores with large ethnic sections. (I got this one at HyVee.) 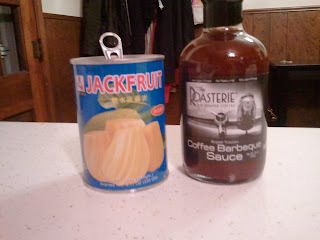 Co-starring is barbecue sauce made about two miles from my work that contains Roasterie coffee. Use any barbecue you like, but check the ingredients if you're vegan. I don't know if all sauces are vegan. Drain and rinse the jackfruit. It's funny-lookin' for sure. Cover it in BBQ sauce. In the future, I'm doing three cans at once in a slow-cooker. 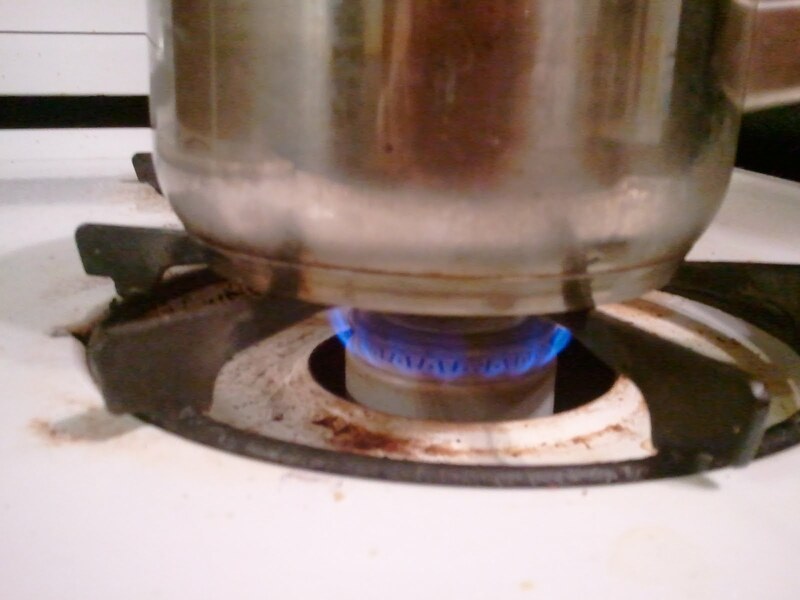 Add a little water and put it on the lowest heat your stove can maintain. Stir frequently and add more water as needed to keep from burning. Cook about two hours, or until the jackfruit is tender. 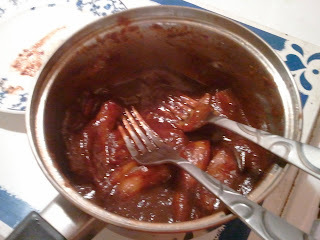 Then shred with two forks, the way you would with pork. This took me 5-10 minutes, and made my hands a little sore. It's so worth it, though! 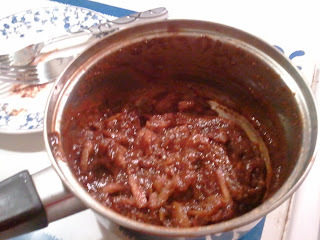 Use as you would BBQ pulled pork. I just put it on a bun or some bread as a sandwich. Low-fat and delicious! It's even better the next day, so you can make a lot and use it later in the week. 1. Put jackfruit in crock pot or saucepan. 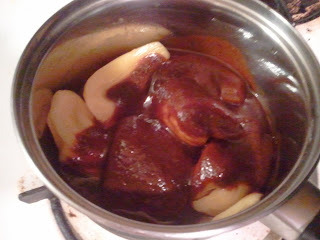 Cover completely with BBQ sauce. 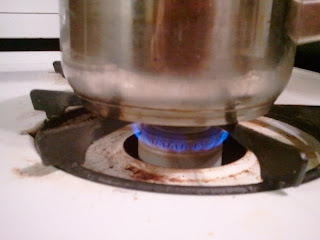 Add about 1/2 cup water to keep from burning. 2. Cook on low heat about 2 hours, stirring occasionally. Add more water as needed. 3. Shred with two forks. Oh yeah! One of our favorites. Crock pot is the best though on low and I slow cook 4 hours. Delish! I didn't know I can get it at Hyvee. That's the same brand I use from the Asian store at RiverMarket. I could kiss you. THANK YOU. BBQ is what I miss most too. I've had the BBQ Sandwhich at Fud (made from jackfruit too!) and it was good. MUST find jackfruit!! !